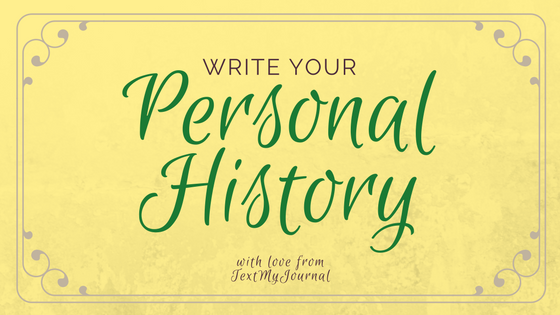 Do you have a personal history? Me neither. Except what I’ve been journaling the last few years. I don’t really consider it a personal history, but that’s exactly what it is. Historically, this is one of the most important reasons people have kept journals. Right? 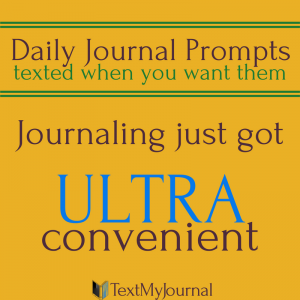 Think about it – a journal is really just an account of your life. Everything you’ve experienced, from your perspective… It’s kind of the whole point. Journaling is inherently designed to help remember part of your life. So instead of going all rogue on how else you can use a journal this month, we’re focused on the basics. The root of journaling. Preserving a personal history. A life story. It seems pretty stressful – I’ve only lived a few decades and the thought of writing down my life… whoa baby, stop there. Ain’t nobody got time for that. I recently had a conversation with my only living grandmother who expressed the discouraging emotions behind trying to write down her personal history. She’s lived a lot of life… Where do you even get started with something like that? So, with her in mind, I sat down and did the most logical thing I could think of – I wrote down questions I’d like to ask her about her life. This list is certainly not inclusive – there are so many things I’d like to know about her life – but this would at least provide a good starting point if we had a conversation about her history. I hope it does for you too! July and August are traditionally the time of year when families get together. (Apparently it’s only considered a “reunion” if there are shirts…) So if you have a minute or 10 or even 60, sit down with some of the older members of your family and ask them these questions. 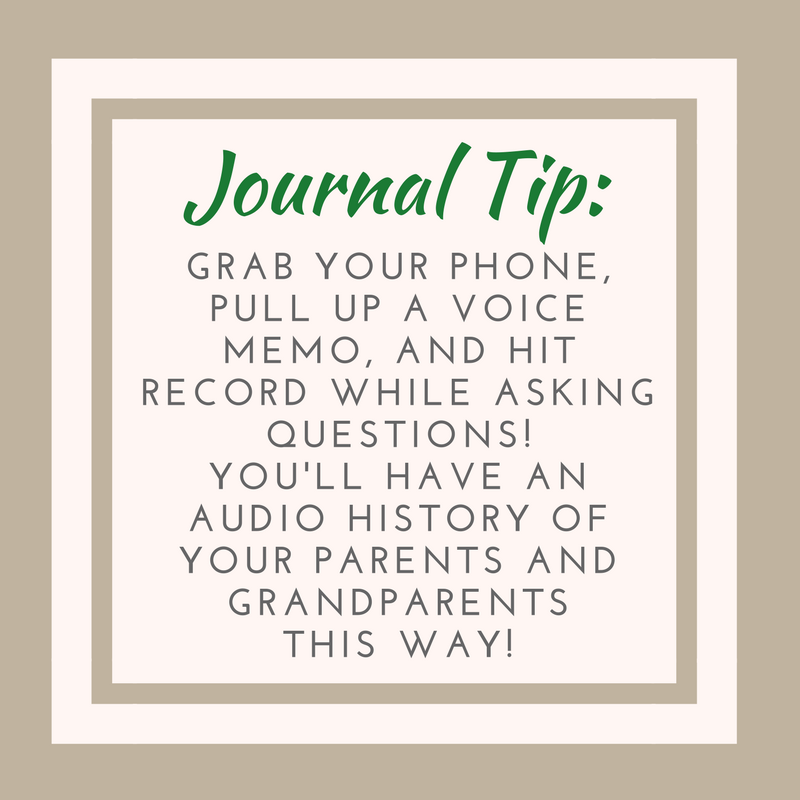 Journaling tip: grab your phone, pull up a voice memo, and hit record while asking questions! You’ll have an audio history of your parents and grandparents this way! Some of the sweetest treasures I have are voice recordings of my deceased grandparents. It’s like a little bit of them stayed behind just to say “hi!” And those moments are priceless. Ok, enough ideas? Let us know how you are using these prompts! We want to know! Write about your name. Where did it come from? What does it mean? Write about your mom. What would you want people to know? Write about your dad. What would you want people to know? Do you have any siblings? Write about them. Where did you grow up? What do you remember from that place? Think about your house growing up. What was it like? What was your favorite activity as a child? What was your favorite place as a child? Who were your friends as a child? Did you travel as a child? What were your favorite places to visit? What did a typical day look like as a child? What did a typical day look like as a teen? What world events were significant to you as a child? Who was your favorite teacher as a child? Did you move as a child? Write about it. How did you typically celebrate your birthday? Write about your favorite holiday memory. What was the hardest part about growing up? What was the best part about growing up? When did you first leave home? Write about that experience. Are there any funny stories that have been passed down through the generations? Write one of them. What were you most proud of as a child? What did you want to be/do when you grew up? Did you become or do it? Who inspired you as you matured? What job has been your favorite? What was the best part of your 20s? What was the best part of your 30s? Are you in a relationship? How did you meet your significant other? Did you have any boyfriends/girlfriends as a youth? Write about them. What are you most proud of as an adult? Where is the most fascinating place you’ve visited? What item will you cross of your bucket list next?